If you’re heading to Epcot at Disney World, one of the best features of the park is all the country specific pavilions in World Showcase. You get to experience and learn about different cultures, people and of course food! Some of these may be countries that you will never visit in your life, while others may be ones you have already ventured to and want to revisit. Epcot allows you to do just that. One of the countries within World Showcase at Epcot is Germany. In the back of the Germany pavilion you will find the Biergarten Restaurant. Here in our Biergarten Restaurant review, we’ll cover the food, ambiance, service and anything else we think will be useful. As usual, we’ll pepper in associated pictures of it all. As you probably expect, the Biergarten Restaurant serves authentic German fare. In addition to the food you will also find a healthy number of German beers, wine and liquor. More on that in a bit as part of our review. One unique thing at Biergarten Restaurant is it’s entirely a buffet dining experience, which provides flexibility to try lots of different cuisine. This is a huge plus to us, as it allows you to experience more food but also swap out your dish if you decide to live a little, try something new and actually don’t like one of your selections. Biergarten Restaurant at Epcot is a one table service credit meal on the Disney Dining plan. 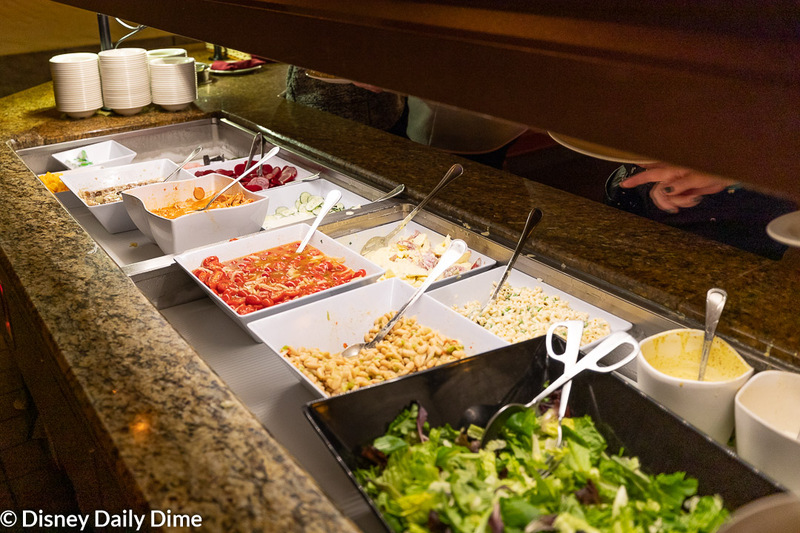 The buffet will cost you around $44 for adults and $22 for kids, which means it is a decent value for your table service credit. Depending on how you are allocating your dining plan credits, it could make sense to pay out of pocket here. Biergarten does accept Tables in Wonderland, which can save you 20% off your bill. One item of note here, Biergarten does not have different pricing between lunch and dinner. 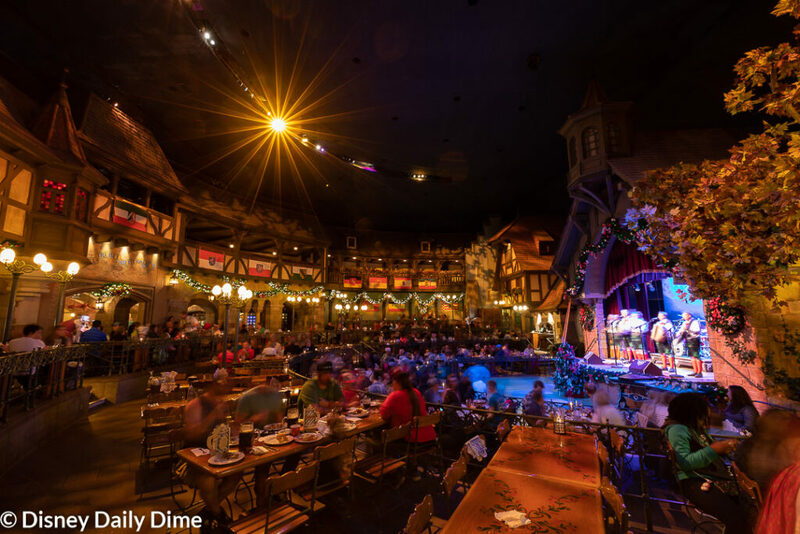 All that said, let’s dive into our Biergarten Restaurant at Epcot review! 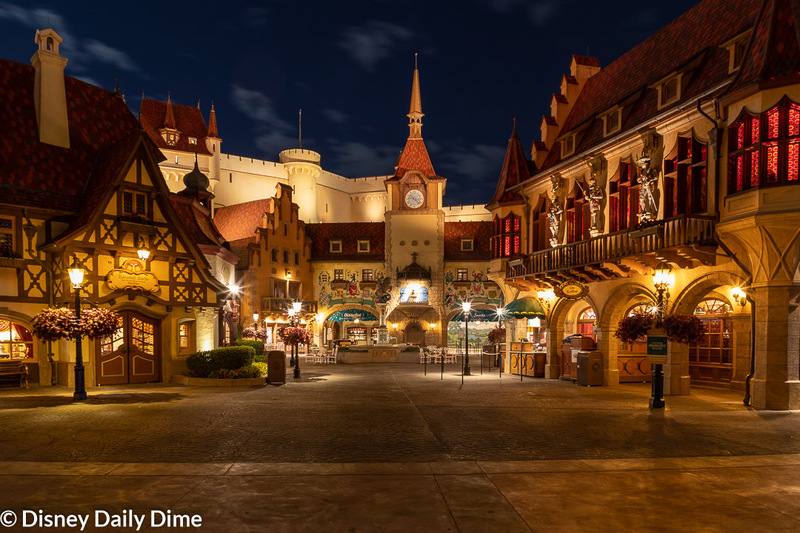 The setting of the Biergarten Restaurant at Epcot is that of a Bavarian village. The Bavarian village feel extends to the whole German Pavilion. The presence of Biergarten Restaurant is actually fairly innocuous on the exterior of the main pavilion. While it’s not the best picture below, note the very understated sign on the left side of the frame that says “erfest”. In the picture below you can see half of the sign for the Biergarten Restaurant. That’s the only indication of a restaurant you’ll find on the outside of the pavilion. While the exterior of the restaurant signage is muted to some degree, the interior is large and alive with fun. As you step inside, you’ll be greeted by the dull roar of patrons dining and communing with each other, in true Oktoberfest style. If the band (called the Oktoberfest Musikanten) is playing, you’ll also be greeted by the sounds of oompah tunes. As you walk into the main dining area, you’ll find a semicircle dining area that is focused on the stage where the polka band plays. What Disney does here again so well, is bring night time inside. You’ll find a low-lit dining area that invokes the feel of an evening in the Bavarian village. Now it’s not as dark as Sci-Fi Dine-In Theater over at Hollywood Studios. You can actually see everything going on here, if that is a concern for you. The night time feel is completed with a projection of the moon on one of the walls and lamps on the tables. It’s all really well thought out and executed. The dining area is set within an exterior country area of the Bavarian village. That setup is accomplished with the façade of various village buildings lining the walls of the dining area that encircle the polka band stage. They also have a large tree and water wheel next to the stage. If you look at the main picture of the blog post, you’ll see the dining area is set up with three seating tiers. This allows you to have a good view of the polka band no matter where you sit. One thing you should know about the seating setup here. It is all communal seating. All of the tables are meant to seat between 8 and 10 people. If you’re party doesn’t take up a whole table, they will seat another group with you. Yes, dining with complete strangers. We’ve eaten here several times over the years and never had any issues with it. We have dined here with other friendly people who we chatted with and people who didn’t say a word to us. If the notion of dining with strangers doesn’t appeal to you, Biergarten Restaurant may not be for you. In front of the stage is a dance area where everyone is invited to come and dance while the band plays. While we usually don’t see too many adults out cutting a rug at Biergarten Restaurant, kids love getting out there and playing. Every time we’ve been to Biergarten, Anna and Elsa don’t hesitate to get down in front the stage and “dance”. As parents, having the kids go dance is great because you can keep eating and have some adult conversation while they play. With the good sight lines and people all around, we never have felt concerned about the kids’ safety. The band engages and interacts with the kids and really makes it a fun experience for them. From an ambiance perspective, Biergarten Restaurant is a top-notch experience for the whole family. 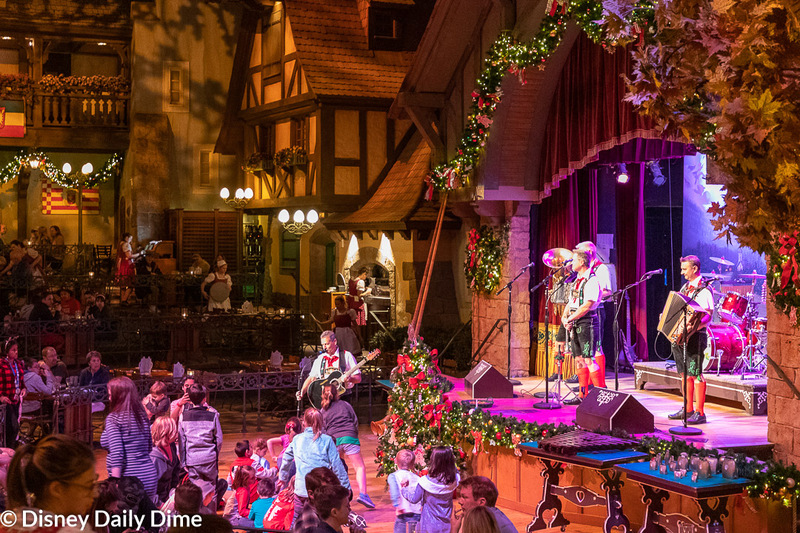 The ability to transport you into a setting that feels like you’re really at Oktoberfest in a small German village sets Biergarten apart from several other restaurants within World Showcase. 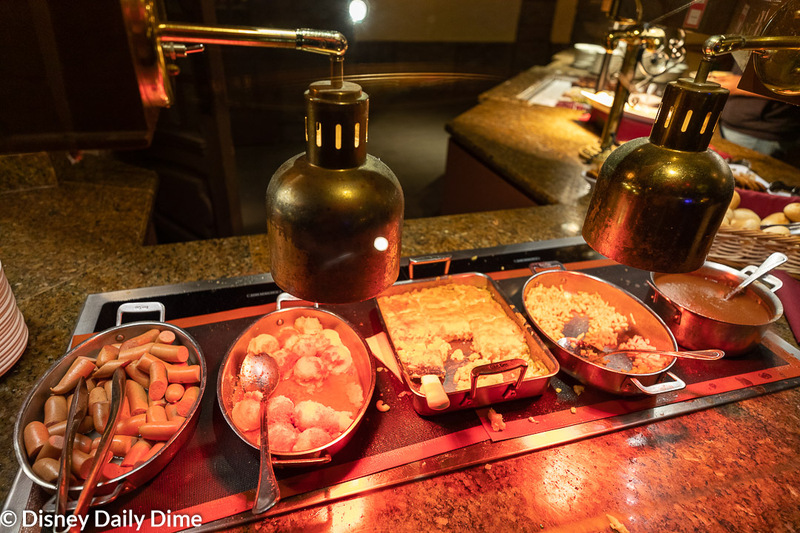 Before we get into some of the details about the buffet at Biergarten Restaurant at Epcot we thought it might be good to discuss the setup. 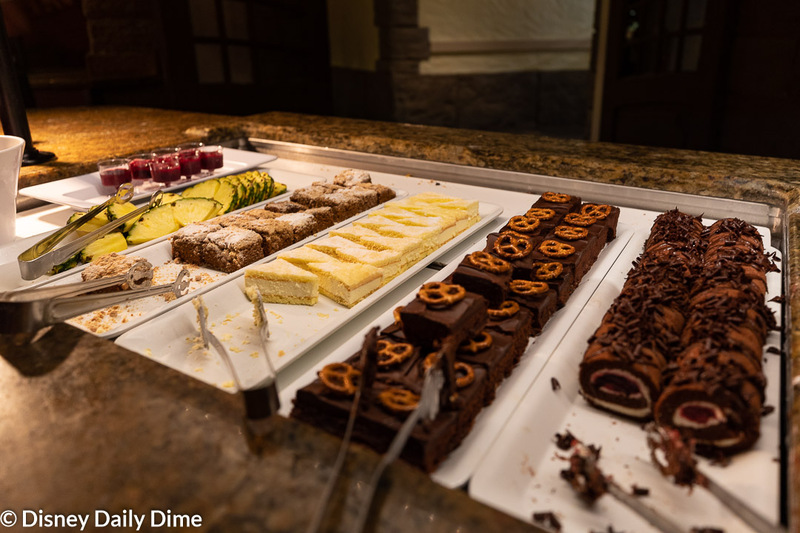 The buffet has two sides to it that ultimately converge in the middle where you’ll find a carving station and desserts. Each side has the exact same thing on it, so feel free to pick whichever side has the shorter line. One other fun thing to witness if you eat lunch here is the tapping of the keg. We didn’t get to see it, but it’s apparently quite the production. Eat early to experience this. Since Biergarten Restaurant is a themed to Oktoberfest, I thought we should spend a little time talking about the beer you can get here. 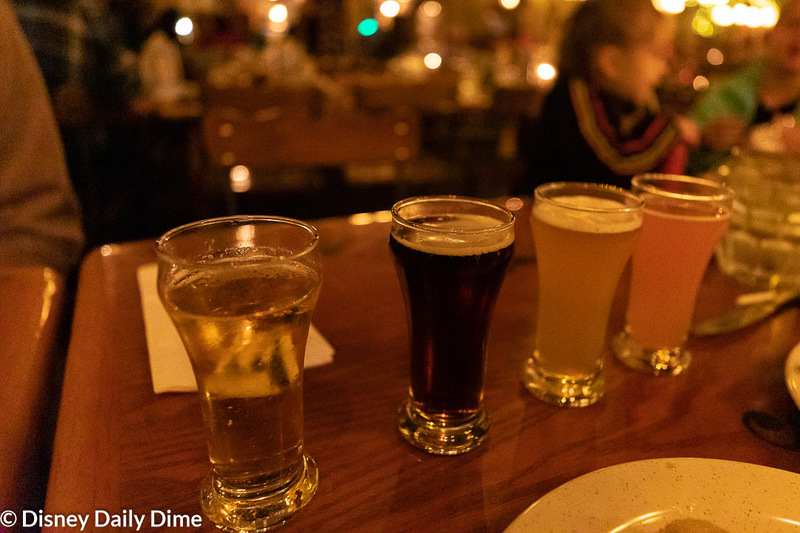 There are four German beers on the menu at Biergarten. How truly “German” they are is debatable, but we’ll leave that to Josh over at EasyWDW who uses his own snarky style to flush that discussion out fairly well. The menu features your average Beck’s beer, along with a König Ludwig Weissbier, a Warsteiner Dunkel, and Schöfferhofer Pink Grapefruit Hefeweizen. You can order them in either a liter or half liter size. If you can’t decide what to have you can order the German Beer Flight and get a 5 ounce pour of each. A friend of ours ordered the beer flight and was nice enough to allow me to sample some. I’m not a big dark beer fan, so I was out on the Warsteiner Dunkel. The Beck’s beer was nothing overly interesting. It’s just like what you get out of the bottle. I enjoyed the König Ludwig Weissbier, but for me the stand out was the Schöfferhofer Pink Grapefruit Hefeweizen. It’s actually half grapefruit juice and half sparkling smooth hefeweizen. I enjoyed it so much I ordered my own half liter of it. Please don’t judge, you beer purists out there. I found it refreshing and crisp with a tangy sweetness. Okay, feel free to judge me…I’m still proud to say it was my favorite. Since Biergarten Restaurant at Epcot is a buffet we won’t do our typical review of individual dishes. Rather we’ll tell you in general terms what items are available to eat and hit the highlights on what we sampled. For appetizers, you’ll find a selection of cold items available. Most of these are “salads”. They include leafy mixed greens, tomato salad, macaroni salad, chicken salad, potato salad and a white bean salad among others. They have mushrooms, cucumbers and other cold vegetables available. The cold part of the buffet also features a cold sausage and liverwurst. The one non-cold appetizer item available is a soup. The soup appears to change occasionally, so it isn’t clear what exactly you’ll have if you decide to dine at Biergarten Restaurant. The soup they had available when we were there was a Beer Cheese Soup, which was fantastic. While I didn’t sample everything, I really enjoyed the mushrooms, potato salad and cold sausage. Although I will say there wasn’t anything that I was just coo-coo for cocoa puffs about. 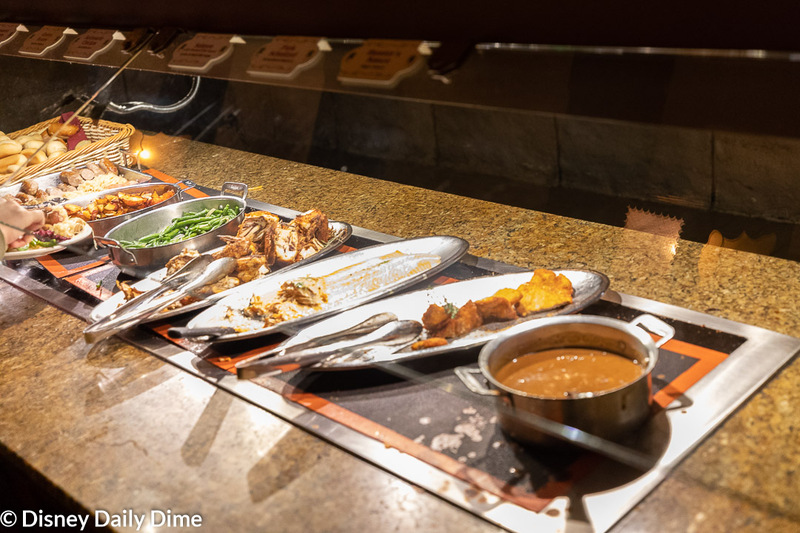 While kids can dine from any part of the buffet they like at Biergarten Restaurant, there is a small selection on the buffet that is more geared towards them. It’s not officially designated as a kids buffet, but it certainly feels that way given what is located in this area. Here you’ll find options of a frankfurter, potato dumpling, macaroni and cheese, spatzle, and a red wine sauce (left to right in the picture). The last is probably not really geared towards kids, but the rest works. Anna and Elsa dined from all over the buffet. However, I will say that for two kids that love mac and cheese, they did not enjoy the mac and cheese at Biergarten. Why? The texture was the problem. This isn’t your traditional creamy type of mac and cheese. Instead it is baked in a traditional German style. I had a taste of it and actually enjoyed it. Yes, it is different from our style of mac and cheese, but it was still good. Just be aware your kids may not be able to enjoy one of their favorite default foods. Beyond that, Anna enjoyed her frankfurter but it was pretty basic. Elsa didn’t enjoy the potato dumpling saying that is was too mushy. She never complained about the flavor, more the texture. There are two areas that are more geared toward adults. The first one is located just after you finish the cold bar. On this bar you’ll find a combination of warm entrée style items and sides. The bar also features bread. The pretzel bread is fantastic, especially dipped in the beer cheese soup when it is available. The headliner to me is the bratwurst and sauerkraut. 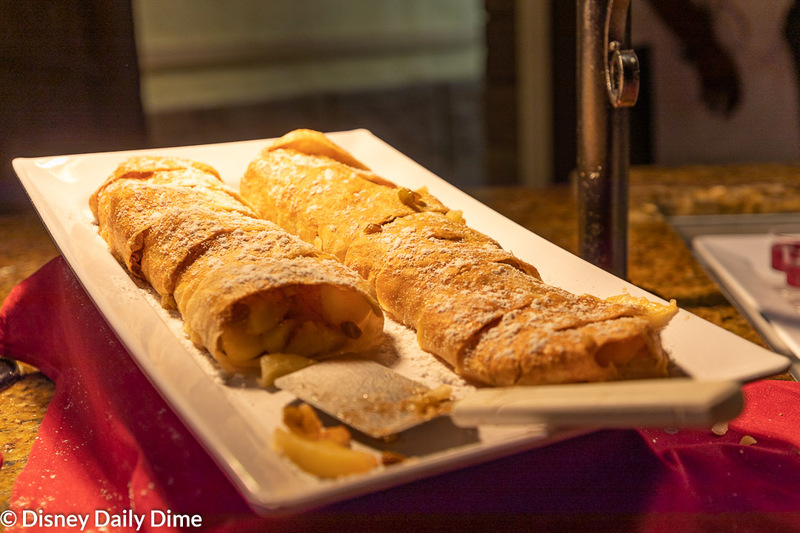 Of all the items you can get off the Biergarten Restaurant buffet, what is more German than that, right? The brats were fantastic. With a light bit of spice, juicy and flavorful, I really enjoyed this. I will admit, I’m not overly big on sauerkraut, but Carla loves it! She says the sauerkraut is excellent here. For the rest of the items here that are more like entrees, they have roasted chicken, salmon and a pork schnitzel. The chicken wasn’t anything memorable and kind of dry. It had decent flavor, but the dryness was a turnoff. I’d say the same thing on the pork schnitzel. I did not have the salmon this day. I had to save room for the carving station! The sides on the bar are a combination of green beans and roasted potatoes. The green beans were a little limp from being out under the heat lamps (but I prefer my green beans crisper so your mileage may vary). 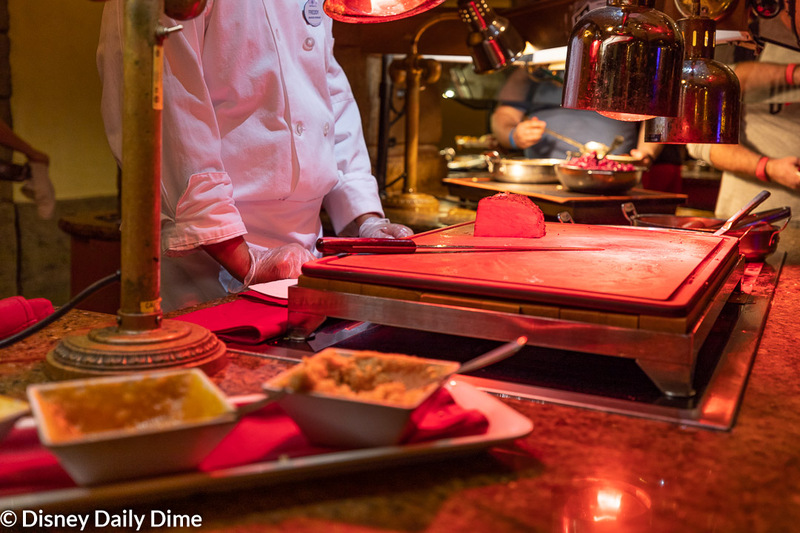 One of the highlights of the whole buffet is the carving station. At the Biergarten Restaurant, the carving station features pork roast, carved beef, and a pot roast. Now you would think since it was some of the best food on the buffet, I would have tons of pictures of these items. But you’re talking about me, right? So, no I don’t have tons of pictures. Instead the best I have is this one sad picture of the pork roast. So instead of pictures, you’ll just have to take our word for it. The pork was phenomenal. Paring it with some of the apricot chutney that was near the carving station was a perfect combination. Although I will say there were several dipping sauces like sweet mustard and apple sauce. The sweet mustard went well with the pork too. Elsa was a huge fan of the carving station, devouring a couple of helpings of the pork roast. The dessert at Biergarten Restaurant was a favorite of everyone. But then again, who doesn’t like dessert! From left to right, you’ll find a red berry compote, pineapple, gingerbread coffee cake, Bavarian cheesecake, brownie and black forest cake. I’m normally a fan of cheesecake, but the cake layer on this dessert wasn’t appealing to me. The texture was just too different from what I am used to. However, the flavors worked well. The brownie and black forest cake were the highlights for me. They were both very good desserts, which is saying something for me because I’m not usually a big chocolate fan. Now, while good, I wouldn’t say the desserts were overly unique or imaginative. In addition to these items, there was also a good apple strudel, that had this wonderful dipping sauce with it. On its own, I’m not sure how I would have felt about it, but the sauce made it very good. You can see it below. By now, we think you know that we equally value theme and food when it comes to dining around Disney World. For the prices you pay, the theme better be spot on. 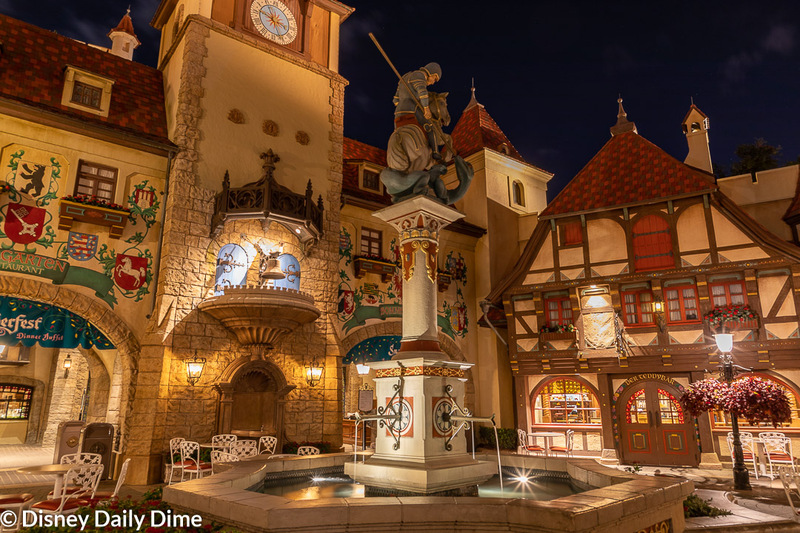 This is where Biergarten Restaurant at Epcot really shines to us. The theming of the restaurant, coupled with the band make this an excellent experience. It’s a communal experience, from the shared dining tables, to the buffet setup, to the entertainment. You feel as though you are there with all your friends from your small village and for just a little while, you’re all family. Some of that family may be your strange uncle, but he’s still one of your clan. When it comes to food, there are definitely some hits and misses. One thing I do believe is that most people will be able to find something that will suite their preferences. It performs well on some important aspects of typical German cuisine. Those items would be the bratwurst, sauerkraut and the carved meats. The beers available also perform well, even if they aren’t the most original German beers. We definitely recommend this restaurant to anyone looking for a fun family-oriented meal. While the food isn’t for everyone and the communal seating may be unusual, it is a meal worth having based upon the theme alone. With that, we’ll wrap up our Biergarten Restaurant at Epcot review. It’s a fabulous German buffet that is brings Oktoberfest to you. We think it is a restaurant that is worthy of your consideration. If our Biergarten Restaurant at Epcot review was helpful, or at least entertaining, please like and share this with your friends or anyone you think will find it useful. Just use the sharing buttons on the page. We always appreciate it when you share our posts, as it allows us to spread the word about our young blog and hopefully allows us to help others.